The Google Alerts feature is probably the most useful tool in battling plagiarism to come out in some time. It enables Webmasters, even those with large volumes of content, to search for new instances of their work daily and be notified when copies of their material, both legal and illegal ones, are posted online. However, using GA can be a very intimidating process. It isn’t a “no-brainer” tool like Copyscape (though it is free and more powerful) and it does require some planning and honing to work properly. Regardless, by following a few simple tips and some common sense, it can be the best solution to a very overwhelming problem. For most people, the hardest element of using GA is picking good search terms. Since the searches are limited to just ten words, one has to be very careful to pick a series that is statistically unique, meaning that it is highly unlikely to appear in any other piece on the Internet. A good tip there is to pick a string of words that isn’t at the beginning or the end of a sentence and includes word choices that are unique to both your style of writing and your topic of discussion. On the other hand, it needs to be something that isn’t likely to be changed, something that’s critical to the piece. What this means is that names and locations probably aren’t good choices to include, but central themes and points are. Any string of text that would greatly damage the piece by removing or altering it is a good choice as long as it is unlikely to be used by anyone else. A good test there is to do a quick check and see if the string turns up many results. If either nothing or just your work appears, then it’s probably a good choice. In the end, picking your search strings may seem difficult, but once you get the hang of it, it’s almost an automatic thing to do. When using GA, I encourage people to use a Gmail accountsabwsvqqtwvuuz because the labeling system is much more efficient at handling a massive amount of alerts than any folder-based setup. However, virtually any email account can be used for the purpose of receiving alerts; it’s just a matter of setting it up. First off, set up a filter to catch all mail from “googlealerts-noreply@google.com” and file it into a specified folder (or label). This should catch all incoming alerts, and put them in a unified place, away from your other email. Then create other folders (or labels) for alerts that are handled, needing attention, false alarms, legitimate uses or any other categories you think you might need. This is the area where Gmail’s labeling system comes in handy because a single alert can contain multiple links and fall under multiple headings. With labeling, you can just apply another label to the letter, with traditional means of handling email you have to make a choice about where to put it. This is an important step because all of the alerts, when they come in, look the same. You’re probably going to want to read the alert and file it away appropriately, to be dealt with when you have more time. This can help reduce the clutter false alarms and legitimate reuse of your work can create. After all, the biggest problem with GA is that it can be a bit too thorough, reporting absolutely everything that it sees and creating quite a bit of clutter for popular sites. Still, too much is preferable to too little. Though GA does searches every day for you, there sometimes is still a delay between when Google spots the new copy of your work and when the alert is sent. Combine that with the natural delay between when an email arrives, is read and is followed up on and sometimes weeks can pass between Google spidering the page and you visiting it. On static sites, this isn’t an issue, but with the rapid growth of blogging and the dynamic content it produces, many times your plagiarized content has been pushed down by the time you visit the page. This means that, after following the link, it appears to be a false alarm and you might be tempted to write it off as an error on Google’s part. Unfortunately, that’s not the case. Despite handling hundreds of alert emails, I’ve never encountered one that wasn’t sent for a reason. Thus, when you are confronted with something completely devoid of the search phrase, it’s important to do your research and figure out what’s going on. First, if the site is a blog, try going back in time and seeing if you can find it. If you can’t, try to track it down from the site’s home page or search page. If that too fails, visit Google and do a search for the exact same phrase that produced the quote. Then, when you find the page you’re looking for, visit the cached version of the site. A few times I’ve caught a plagiarist right after they’ve changed their site completely and eliminated all old content, other times the work has either merely been moved or bumped down. Either way, it’s important to take a few moments and figure out exactly what’s going on. After all, GA is a powerful tool but it fails if the human element of it doesn’t take the time to use it properly. Finally, remember that no one is perfect and that it’s impossible to completely predict what is statistically unique every time on the first try. If a search generates too many false positives, change it out for something else. On that note, be aware that any changes you make to your site could result in GA bombing you with a slew of false positives as it recognizes the changed pages as being new instances of the phrase. While this shouldn’t stop you from making needed modifications, don’t panic when and if GA blasts you with a new alert for each piece you put into it. 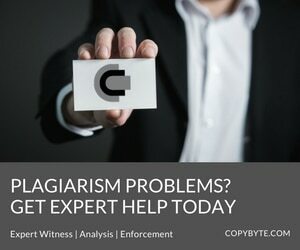 In the end, GA is a very powerful tool that is easy to use and can almost completely automate the plagiarism detection process. It’s too valuable of a tool to pass up on and only takes a few moments to learn how to use. It’s worth taking a few moments to learn a tool that’s free, fast, practical and powerful. GA is to plagiarism searching what a nail gun is to carpentry. A vast leap forward in speed and power with just a small trade off on difficulty of use. Still, I don’t think anyone is going to choose to hammer nails if they have a choice and I doubt many will continue doing hand searches once the power of GA is fully discovered.